Many of the city’s German-speaking inhabitants referred to New Year’s Eve as the night of the Holy Sylvester, named after the Catholic feast day of Saint Sylvester on December 31. The holiday was celebrated in a variety of ways that invariably included merry-making and drinking. The menu below is titled “Sylvester Kränzchen,” meaning that it was for a small New Year’s Eve party. 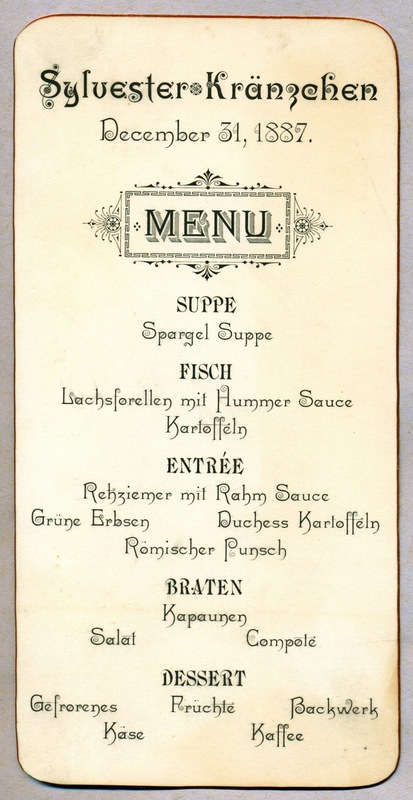 The bill of fare includes traditional German dishes like white asparagus and roe deer venison.2 Although the menu is in German, it was printed using with a distinctive American typeface—one of thousands of different fonts employed in a style called “artistic printing.” Many of these ornamental typefaces were designed by German immigrants who worked as punch cutters in the type foundries. 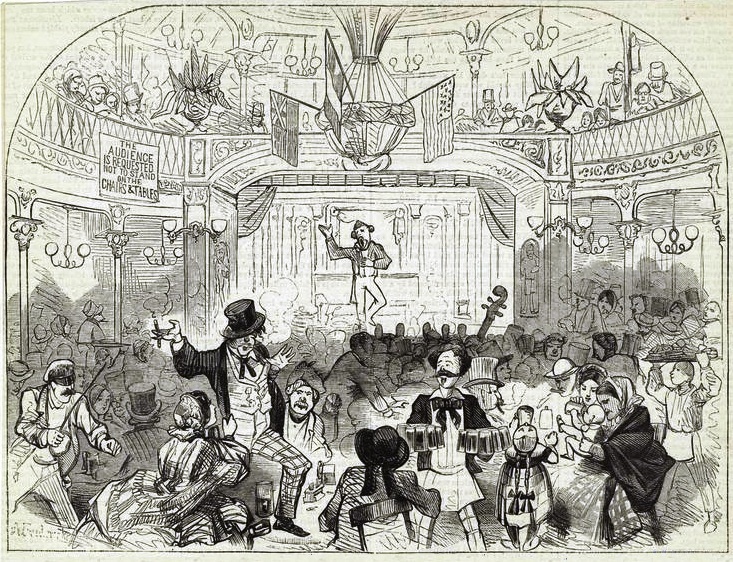 The provenance of menus and other types of ephemera is seldom recorded, even though such information is often needed to put an item into context. 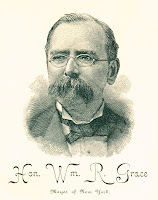 Fortunately, we know that this menu was saved by William R. Grace, the city’s former mayor, suggesting that a prominent German-American family hosted this event in New York. Without the history of ownership, we would not know the location and social setting of this late-night supper. 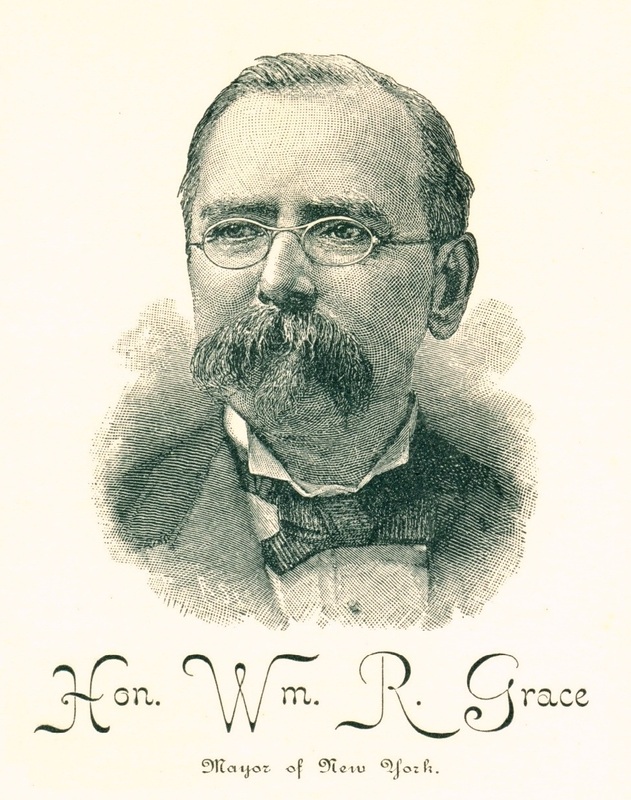 Irish-born Grace was a popular, reform-minded politician who knew where to find the voters. Given how much of the German influence in New York has vanished, the population statistics of the period are revealing. In 1890, the U.S. census reported that 640,000 of the people living in New York were born in Europe, representing 42% of the city’s total population—the largest group of foreign-born citizens came from Germany (211,000), followed by Ireland (190,000), Russia (49,000), Austria-Hungary (48,000), Italy (40,000), and England (36,000).3 Fortunately, this menu survived with its provenance intact, showing us how some of these newly-minted New Yorkers celebrated the arrival of 1888. 1. William Grimes, Appetite City, New York, 2009, p.89. 2. The relatively small, reddish and gray-brown roe deer is prevalent in Europe. By comparison, the white-tailed deer is common in North America. Fascinating, Henry. There really isn't much sense of a German heritage in NYC now, is there?